The passcode to unlock my 1Password keychain is long—very long—and typing that in on an iOS device is time consuming and error-prone. For iOS devices that support TouchID, you can open 1Password simply through recognition of your fingerprint, in the same way you unlock the device itself. For iOS devices that do not support TouchID, 1Password allows you to set a four-digit PIN that can be used to unlock 1Password after you’ve initially authenticated once with your passphrase. This option remains secure, in that you only get one chance to enter your PIN; if entered incorrectly, the app again requires full authentication with your passphrase. Either from having naturally sweaty fingers, or living in a humid, costal environment—or a combination of both—TouchID does not reliability work for me. In fact, it only works about 10% of the time I try to use it. From scan-setup of the same finger multiple times, to complete resets, I’ve tried every recommended approach to improve TouchID—but all to no avail; it simply doesn’t work for me. As a consequence, while 1Password is usable for me on my iPad mini via the PIN mechanism, it’s awful to use on my TouchID-enabled iPhone 6. Every time I need to open 1Password, I have to type in that very long passphrase. For that reason, I wish that 1Password would offer the PIN access mechanism on TouchID devices, as an option. Speaking with the support staff at Agilebits, they’ve communicated that this isn’t possible, because the current implementation is to offer TouchID on supported devices, and fall back to offering PIN access on devices that don’t. But that’s just the way it’s currently implemented; there shouldn’t be any technical reason why 1Password couldn’t offer both options on TouchID devices. I understand that I’m in the minority, and that for most people, TouchID works just fine. And I know that many product decisions are made considering trade-offs related to the size of affected groups. My hope, however, is that the people at Agilebits can consider that the cost in usability of this particular problem, for those in the minority like myself, is huge, and creates a situation encouraging the use of a shorter, less-safe, passphrase. And perhaps considered in that light, they’ll add both options to 1Password running on TouchID devices as well. Should I restart my Mac each day? I transport my MacBook Air daily between home and the office—closing the lid to put it to sleep, and opening the lid to wake it. Twice per day, every day. I’ve always hoped that the Mac OS is designed to handle these interrupts gracefully, but I’m beginning to wonder. It seems that each time I restart my Mac, I see evidence that things are getting suspended or stuck—Carbon Copy Cloner alerts me to the fact that my backups haven’t run in a while, HazelHelper starts posting literally thousands of notifications, OmniFocus alerts me to 900 items that need archiving, and even the visual appearance of icons on the desktop change. So I’m beginning to wonder whether I should get in the habit of just restarting the machine every day. Posted on June 30, 2015 March 26, 2016 Categories TechnologyTags MacLeave a comment on Should I restart my Mac each day? Since starting to listen to podcasts a few years ago, I’ve always used the Instacast app. Recently, though, I decided to check out Overcast, by Marco Arment. Having used Overcast for about a week now, I’ve collected some observations and initial impressions. Earlier this year, I described how I used a combination of Espionage and Dropbox to share confidential documents among our family’s Macs. Unfortunately, that approach proved too problematic and I’ve since had to switch to a new approach—based on the Tresorit service—which, while not a perfect solution, does represent an improvement. A while back, I ran across an article (which for the life of me I can’t find now) in which the author meets with a computer hacker at a public location—a Starbucks coffee shop—and demonstrates the surprising amount of information he can collect by intercepting the traffic between the Starbucks public wifi and the locally connected customers. It is truly scary! After a friend passed last week, I was forced to reflect on the matter of how our personal and confidential digital data would be passed on and entrusted to others in case something unexpected happened to my wife and I. For more than a decade, I’ve been accumulating music and curating playlists in iTunes, all of which has physically been located on the SSD of my MacBook Air. And for the past couple of years, I’ve been sharing that library with other devices—computers, Apple TV, iOS devices—via iTunes Match. About a month ago, a notice was posted to the Pin Drop blog announcing that the app would be shutting down. Even though we make a competitor app called Rego, it was sad to read this news. There’s plenty of room in the location bookmarking space for a couple good apps, and Pin Drop was definitely one of the few we admired. I’ve been unable to install Yosemite on a mid-2011 iMac. Apple are aware, but so far haven’t been able to help. Here’s the story. I’m in the process of recovering from a Dropbox disaster, and wanted to document it here in case it may prove useful to others. For years, I’ve been accumulating an archive of files at home on an external drive connected to a Mac mini. These are files that I do not expect to need in the future, but at the same time wouldn’t really be happy about losing—for example, snapshots of filesystems of computers I’ve retired, some source media, etc. All in all, the drive contains some 300 GB of data. A couple of days ago, I posted an article detailing how to use Keyboard Maestro to create todos in OmniFocus 2 that are linked to original messages in Mail.app. Security-conscious Ben Brooks thought the idea was neat, but couldn’t give it a try, as it relies on the use of the OmniSync Server. I have a MacBook Air, and my wife has an iMac. The challenge is to have shared access to our family’s documents, while securing those which are confidential. This article describes our solution. A few weeks ago, and way late to the game, I started listening to podcasts. Of the several I’ve heard so far, the ones I enjoyed have included Horace Dediu’s “The Critical Path“, Benedict Evans’s “Cubed“, Gabe Weatherhead and Erik Hess’s “Technical Difficulties” and Shawn Blanc’s “The Weekly Briefly“. The ones I’ve disliked have included John Gruber’s “The Talk Show” and Marco Arment’s “Accidental Tech“. While waiting for version 4 to be released, I’ve had to temporarily uninstall the MailTags plug-in from Mail.app in OS X Mavericks. One of the most-used features of MailTags for me was its ability to copy the selected message’s URL to the clipboard. I often use message URLs to provide myself with reference to conversations, important decisions or tasks that are captured in emails. Without MailTags installed, though, I’ve been really missing this feature. My friend, Stefan Seiz (@seiz), however, was kind enough to email me an AppleScript that provides this same functionality. From that, I created a Keyboard Maestro macro, and assigned it to a keystroke. If you use Keyboard Maestro, feel free to download the macro here. In the past, all the devices in my home operated over a single wifi network—including four Macs, an AppleTV and several iOS devices. I’ve long suspected I was probably overtaxing the wifi, and listening to the recent “taming wifi” episode of the Technical Difficulties podcast inspired me to do something about it. Periodically—and frequently—a process called, “tccd”, would momentarily ramp up its CPU usage to around 50%. At the same time, the process’s memory would grow and grow. When I checked this morning, it had grown to 1.3GB. In this post on the Apple Support Communities forum, a user reports high memory usage of the tccd process, but there are no solutions proposed. In another post someone mentions that the tccd process manages which applications have access to your contacts. That appears to be correct—after I deleted the TCC.db database, the OS started popping up lots of dialogs asking permission if this app or another could have access to my contacts. But resetting the TCC.db database unfortunately didn’t solve my problem with the tccd process using lots of CPU and memory. 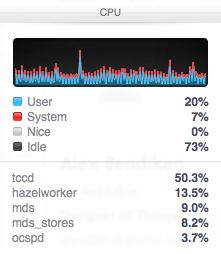 Watching the Activity Monitor for a while, I noticed that Hazel’s “hazelworker” process sometimes ramped up around the same time as the tccd process—you can see this in the screenshot above, in fact—so I started poking around there. What I found is that several of my Hazel rules involved moving files to a folder which no longer existed (I had moved it a few days ago). After fixing those rules, to my amazement, the problem with the tccd process completely disappeared. So, somehow, the root of my tccd problem was the existence of broken Hazel rules.